Let's face it: You've thrown together a last-minute dinner more times than you'd care to admit. Afterward, you've probably made a vow to do a better job planning healthy meals, which lasted until the next day that you found yourself scrambling to get things done. 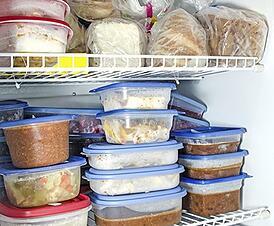 Why not save time and reduce stress by planning, cooking and freezing meals for an entire week? We've put together a handy reference guide with how-to tips along with reasons to cook and freeze, just in case you need more convincing. Clear out space in your freezer. You don't want that sinking feeling you'll get after cooking for hours and discovering you have no place to put the food! When it comes to freezing meals, not all foods are created equal. Do you have a favorite dish that's easy to make ahead of time? Share it with us in the comments!